As medical costs are spiraling out of control , health insurance companies are trying to do their best to control their losses. Because of medical inflation , they are losing money hand over fist. Newer medical procedures are often much more costly because they need sophisticated technology and a lot of expertise. These surgical interventions are often intricate and time-consuming – and because doctors need to use expensive equipment such as lasers, robots and three-dimensional television screens to perform them, they charge more for the newest techniques. Patients are usually quite happy to pay for these additional newer treatments . For one, the doctors convinces them that newer is better and that the results of the new techniques are better than the old-fashioned way of doing things. Also, when patients have a health insurance policy and don’t need to spend extra out of their own pocket, they are quite happy to do whatever their doctor tells them to , no matter how much the cost ! Even though there maybe less expensive alternatives available , when the doctor makes a particular technical recommendation , most patients are not going to challenge him ! After all , doesn’t the doctor know best ? Isn't he the expert ? And why should the patient care about the cost ? 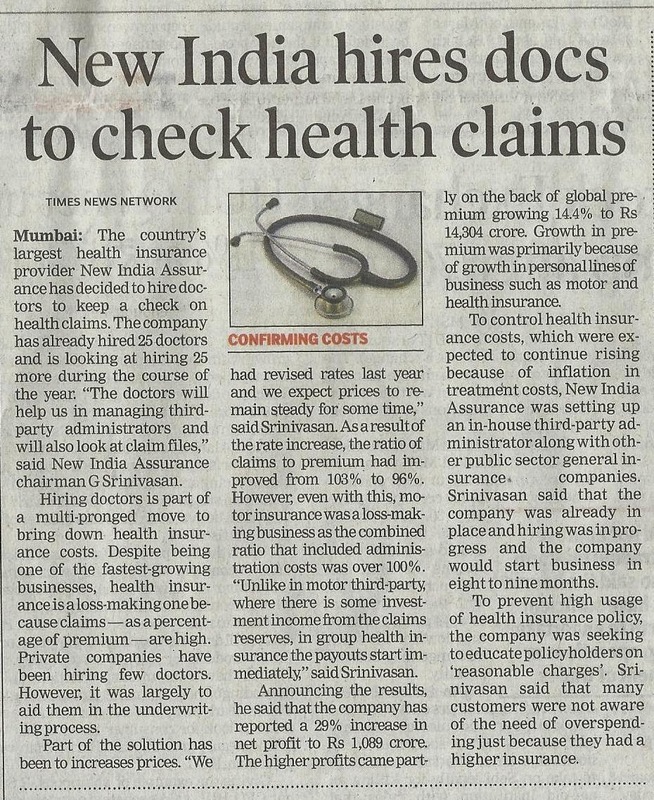 After all, isn’t that the reason they have been paying their hefty premiums for their insurance policy – so that when they do fall ill, the insurance company will pick up the tab, so that they can afford to get the best medical care, using the latest and most advanced and sophisticated technology available ? Health insurance companies are now pushing back, because they realize that this moral hazard ( where the user does not care about the cost because he does not have to foot the bill himself) is causing them to hemorrhage money. They realize that they will not be able to have a sustainable business operation if they keep on paying out in claims more than they collect in premiums every year. It’s hard for insurance companies to pass on the costs by increasing the premium year on year . If the claims loss ratio keeps on increasing, how can an insurance company possibly continue to be financially viable ? Insurance companies are trying to control their costs by cutting down on fraud and reducing administrative overheads. This is all for the best. However, the controversial issue now is that they are trying to curb spending on medical expenses as well , by telling doctors what they are allowed to do - and what they are not. They know that lots of doctors are doing procedures which are unnecessary . They are trying to control the epidemic of avoidable care . They are appointing more doctors on their panels to vet the submitted claims, in order to check if the treatment advised by the doctor was “medically necessary” or not. This is called utilization review, where the insurance company doctor reviews your medical history and the doctor’s advise, to see if they fit in with the company’s medical guidelines. The problem is that this kind of “after the fact” review can cause a lot of heartburn and angst. Once the surgery has been done, if the insurance company now rejects the claim and refuses to reimburse the medical fees, everyone is upset and angry - especially the patient. Customers feel they have been cheated by the insurance company. Even though he's been a good customer for many years and has paid his premiums promptly without quibbling, when he falls sick and needs medical care and submits his claim for paying for the medical treatment advised by his doctor, the insurance company is now refusing to pay the money . He believes that it’s the insurance company’s job to pay for the treatment, and that they should not try to play doctor and second guess his doctor’s advise. After all, isn’t it his doctor’s job to decide what the best treatment for him is ? After all, his doctor has examined him and knows his case intimately . What right does a doctor employed by an insurance company, who is sitting within the four walls of an airconditioned office know what the right treatment for him should have been? Doctors are also rightfully upset, because they feel that the insurance company is trying to usurp their autonomy and interfere with their professional decisions. By agreeing to pay for only the older and cheaper procedures, they are depriving the doctor of offering “state of the art” treatment to his patients, just because it costs more ! This is why this has become a health insurance company versus doctor and patient confrontation – some of which hits the newspapers on a regular basis; and a lot of which ends up a court of law. It's not that doctors are blameless. Many of them do lots of unnecessary procedures and pad their bills when they know the patient has a health insurance policy. After all, insurance companies have deep pockets , and are seen as being soft targets which can easily be milked. The only way to stop this negative vicious cycle is for insurance companies to realize that they need to align themselves with the patient . The best way they can put patients first is by providing their customers with Information Therapy. If health insurance companies proactively educated patients about their treatment choices , before they even went to their doctor, everyone would benefit. Well-informed patients will be able to ask their doctor more intelligent questions and make better choices. They would understand that more expensive treatments are not always in their best interests – and that often old is gold, because more established procedures have a much better safety record. In fact, sometimes masterly inactivity is far better than an invasive procedure. Thus, not every patient with knee pain needs an arthroscopy – but most orthopedic surgeons will reflexively advise this procedure for every patient who comes to them, because they have been trained to do so. Information Therapy – the right information at the right time for the right person – can be powerful medicine! Ix can help patients save money on medical care by Promoting SelfCare , and helping them to do as much for themselves as they can Helping them with Evidence-Based Guidelines , so that they can ask for the right medical treatment that they need – no more and no less Helping them with Veto Power, so they can say No to medical care they don’t need, thus preventing overtesting and unnecessary surgery . Information Therapy can help patients to make the right decisions for themselves . By investing in Ix, insurance companies will be able to show their customers that they are interested in helping them to get the best possible medical care , and not just in maximising their profits by pinching pennies.